I’ve been sent several things in the mail to review over the last month. So, I’ve decided to do a big single post. Please note that I only share what I absolutely love. First up, this lovely book set, compliments of Creative Publishing International, Felted Feather Friends by Laurie Sharp and The Complete Photo Guide to Felting by Ruth lane. These books are beautifully done. There are so many adorable bird projects with great photo instructions in Felted Feather Friends with focus on needle felting. In The Complete Photo Guide to Felting, there is a lot of information on wool, tools and resources with instruction on Fiber preparation, dyeing, design, wet felting, nuno felting and needle felting. Lots of great projects and inspiration to create armatures, fiber art and things to wear. You can see my attempts at owl making in the first photo. Great instructions guided me easily through. I’m giving away both of these books as a set. So leave a comment letting me know you are an aspiring felting artist and would love this set! Sorry, US only. I will announce the winner on Tuesday in this post. Thanks so much for the comments!! 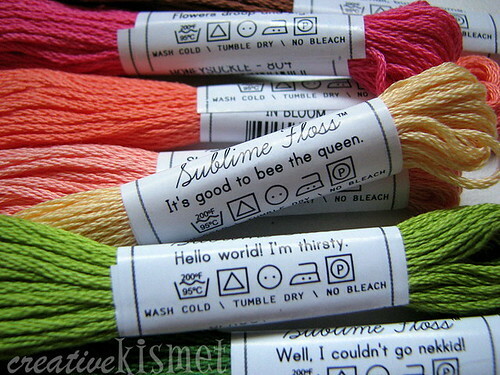 Next up: This crazy awesome set of embroidery floss by Sublime Stitching. Aren’t the colors totally delicious?! My favorites are Fruit Salad, Flower Box and Break Dance. You know how I love bright colors. The packaging is just perfect and look!, little messages on each tag. Too cute! Lastly, Lots of Buttons allowed me to pick $10 worth of buttons so I could see their selection. 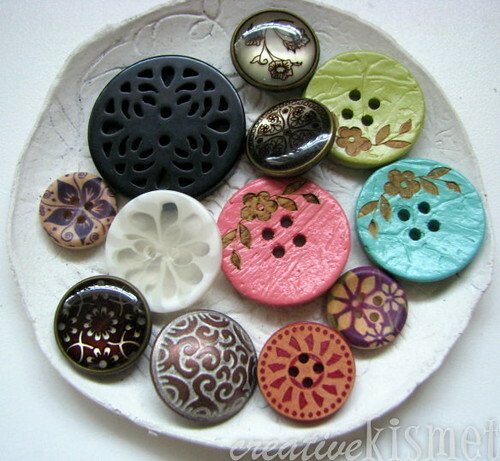 They have thousands of buttons to choose from and are currently offering free shipping if you purchase $10 or more. I don’t usually use buttons for clothing. Mostly for bags, wallets and fabric wrist cuffs. That’s what I’ll be using these little beauties for. Go check them out! You’ll get lost in button heaven. This entry was posted in Reading, Sewing. Bookmark the permalink. 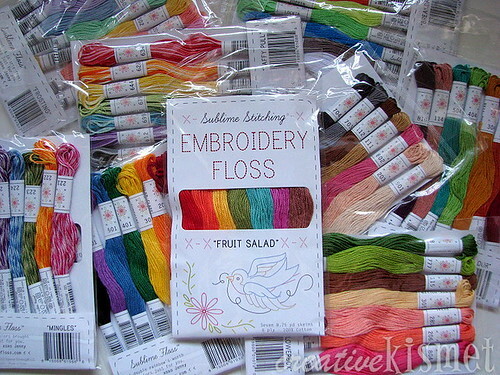 I love the offerings, but I would love to win the embroidery floss. The solos are so yummy and I would use them on the breast pockets I am making for Melanie Testa. What a wonderful and generous idea you have. Eeek! I love your owl! So cute, I bet your boys love it. 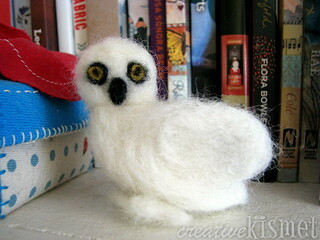 I got a felting kit for Christmas last year, but I’m chicken to try it… Don’t want to waste the roving, you know? I should definitely check out a book or two. Especially with such great photos and cute birds. I would love the bird felting books. How fabulous! I’ve made a couple birds – one ended up looking very, very sleepy. I’ve always loved everything wool and am so drawn to felting, but no clue where to begin. I’d love to win these books and figure it all out. I especially love the bird theme. Your owl is so sweet! Thank you for your review, the giveaway opportunity, and the cute owl inspiration. These books look fabulous. I have made felt beads, but would like to expand my repertoire of felting skills to include needle felting. What a great give away!! I have been seriously thinking about trying out felting, but haven’t really gotten up the courage to take the first step yet. The books look like a great way to get started. Love your owl! I’ve done a few needle felting projects ~ a cat and a bird and love the process of taking a bit of wool and making a lovely little something with a (really sharp) needle. Your little owl is too sweet. Beautiful books! 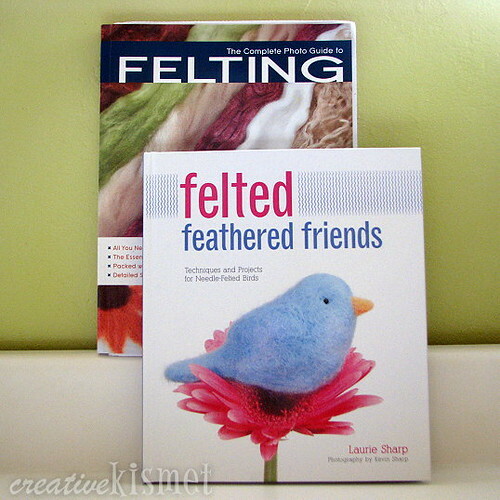 I LOVE birds and have tried felting a bit so I would love these books! Thank you for this chance to win them!! I just recently started dabbling in felting. What fun! I love your owl. After learning to embroidery as a child, I’ve returned to my roots by stitching little enhancements on my felt creations. Any of these prizes would be a wonderful way to stimulate the creative juices. I am new to felting and I just love it — there’s no wrong way to do it! I sit in the bleachers at my daughter’s volleyball games and needlefelt flowers while other people look at me curiously. I’d love to win the books — they’d help me move beyond flowers!! Thanks so much for the giveaway! I’ve been wanting to try out felting. These books would be great, thanks for the giveaway! Love birds and I have some felting supplies but haven’t attempted it yet. This looks like a perfect starting point, please enter me on your giveaway!